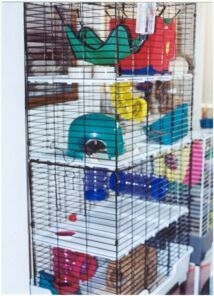 The first of three Super Pet Cages I purchased was the Super Pet Deluxe 4 level cage. It's dimensions at 32"x20"x30" could adequately house 2-4 rats. The cage came with the stand making it sit at about chest high. 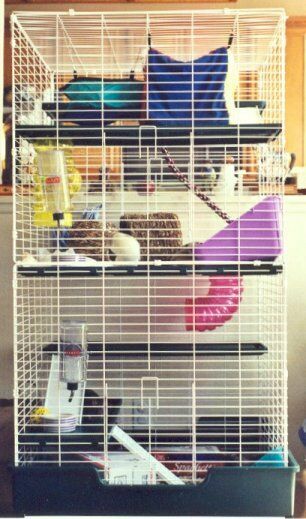 The other two cages, the Super Pet Multi-Floor Ferret Home with dimensions of 32"x20"x56" and the Super Pet Ferret Kingdom with dimensions of 32"x32"x61" also come with their own stands and afforded space for several rats to be housed together. All three cages come with coated bars to prevent corrosion as well as hard plastic shelves that are adjustable to different levels as well as removable. In addition all three cages come with the top of the cage having plastic hinges to provide access. The two larger cages have small troughs that line around the shelves to act as reservoirs and keep the shelves themselves dry. The ladders, also made of solid plastic, can be placed anywhere along the shelf. These cages come with ferret tubes to go from one level to the next as well as using the ladders. Each of these cages has a deep litter box shaped base that is also made of hard plastic. 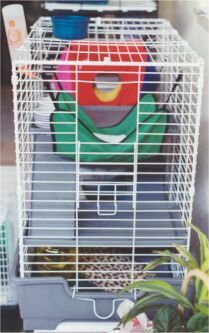 The smaller cage has one front-hinged cage door and side doors. The medium size caged has similar cage doors at alternating levels of the cage and the largest of the three cages has four hinged doors, two on each level opposite one another. I found all three of these cages to have plenty of room to add play and sleep items to and still leave enough area for exercise and additional litter boxes. The material of the bars, shelves, ladders and bases made for easy cleaning. Cages that come disassembled, I found easy to put together. One of the cages that I had to assemble came missing some of the plastic hinges. Super Pet was courteous and very prompt sending out the additional pieces at no charge. Some of the disadvantages I noticed with these cages, were that the bars though spaced close enough for adult rats, were to far apart for ratlets (I might mention here that Super Pet does make a much smaller one level cage for small pets). The height of the two largest cages and the small size of the cage doors, as well as the shelves troughs made access to cleaning difficult. Also the stand that comes with the medium cage has taller legs making the cage slightly wobbly though not easy to tip. The price of these cages run a bit more than some of the other makes but the overall quality of the cages are quite good. Also the Super Pet toll free number is (800)252 P-E-T-S. Despite some of the minor inconveniences I am pleased with the cages and also with the customer support provided by Super Pet for their products.